Home > US Sports > NHL > The Toronto Maple Leafs: Better, Worse, or The Same? Better, Worse, Or The Same? The Toronto Maple Leafs have made the playoffs two straight years. However some big pieces have moved in the offseason including the acquisition of John Tavares and dropping the likes of JVR and Bozak amongst others. 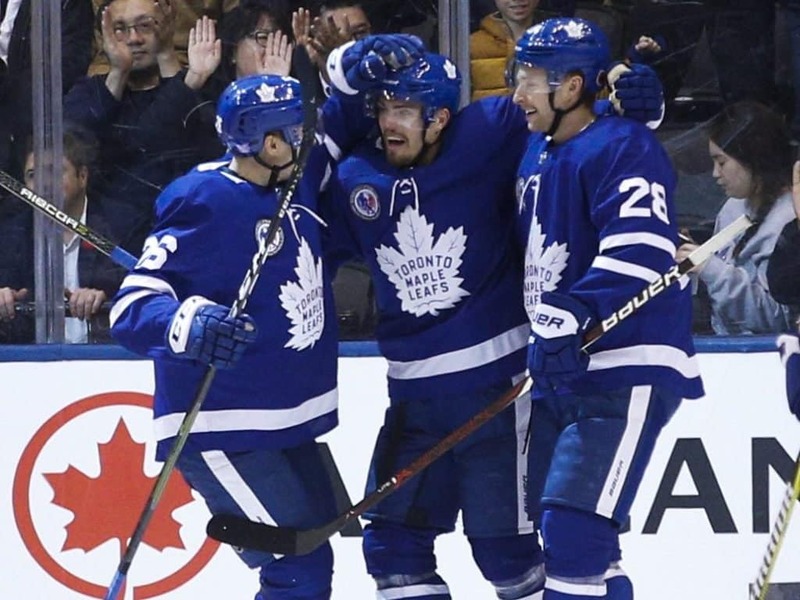 In this article over a quarter of the season in we will look at The Toronto Maple Leafs and if they are better, worse or the same as last year. We will also take a look at if they will make the cup, where they will finish in the playoffs, and what was right and wrong this offseason and regular season. Things the Leafs did right in the offseason included picking up John Tavares, the end of the Lou saga, and freeing up cap room. Now obviously when you bring in a new GM and especially a young buck like a Kyle Dubas over an experienced guy like Lou Lamoriello, you’ll have some upset fans much like I was at first. How do you fix that problem? The acquisition of one John Tavares, not only did Dubas sign J.T. but to do it he beat out Lamoriello who became the new GM of Tavares’s former team the Islanders, who obviously wanted to keep the star and captain in Long Island. Another big thing they did was free up cap which was desperately needed for the abundance of young talented players about to come off their entry-level deals. Things the Leafs did wrong in the offseason included dumping JVR and McElhinney and not striking a deal with Nylander fast enough. Part of being a GM is cap control, not everyone can keep their jobs and they have to make the right deal with the right guys. JVR is good for 50 goals a season and clicks as a locker room leader for the young Leafs however when it came negotiation time they just couldn’t afford to keep him on the roster so that one is a move on, especially when you get a guy like Tavares when compared to JVR or even him and Bozak combined. However one that stings more is getting rid of McElhinney a solid backup goalie who knows his role on the team, since leaving the Leafs he’s been an absolute star for Carolina when their starter went down with an injury and what about the Leafs new backup who was promoted from within? Well we’ll get to that in the next part of the article when discussing regular season hits and misses. Now we have to get into the long, long, long often and I mean OFTEN talked about Nylander situation, it was reported ever since the offseason that the Leafs were going to sign him regardless if that was the case why did they wait until the very last-minute of the last hour of the last day that they could under league rules sign him? Now when he plays thus far since coming back he looks like a guy who hasn’t broken into playing NHL hockey in almost a year and that is bringing the whole team down. The Leafs are producing well as a unit with 19 Power Play goals which is a big step up from the way they played on the Double P last season. Now they have a top 5 Power Play Unit in all the league. Although looking at the numbers as a whole with Sparky having a .913 save percentage and a winning record in the games he’s played he doesn’t look to be in the zone. The saves he does make look more lucky and sloppy than they look good. With Big Mac over in Carolina looking hot was now the time to promote Sparks or should they have kept McElhinney another year and moved Sparks up and down? I believe the latter. Sparks doesn’t have the experience and could have played another season in the AHL while moving up 10-12 games for the Buds. If you want to win games you need goals and with 4 Leafs currently in the top 10 for points they are doing just that. They have players who are excited and feeding off each other which is creating great chances set up by good passes. Miss: Losing to the Same Teams the Same Way. Another big issue with The Leafs is their inability to beat teams that can outplay them physically or defensively. In the recent loss to Boston they got out physically played which lead to dumb penalties and mistakes which cost them the game. If they can’t beat Boston or the following game with Tampa Bay then they can’t win the cup. Now we’ll put everything together and figure out if the Leafs make the cup or where they will finish. I would predict by taking all things into account that The Leafs will: Not Win The Cup. The Leafs will however make the second round of the playoffs after finishing 2nd in the East and having home ice advantage. I predict that Toronto loses in 5-6 games in Round 2 of the NHL Eastern Conference Playoffs.